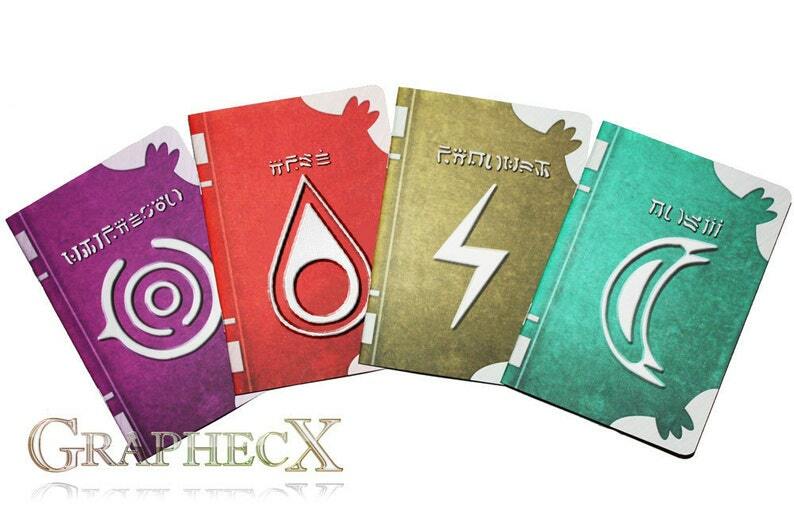 This journal/notebook is inspired by the spell tomes from Fire Emblem. The notebook can be completely personalized. The pictures are only an example of the possibilities. Please contact me with your wishes. Everything can be personalized! Please read the following description about the material and size before ordering. The inner pages (80 gsm/54 lb) can be blank or lined. The pages can be white, light brown to resemble parchment or light grey to resemble worn out paper. There is an automatic discount if all 4 journals are ordered at once. Please contact me if you would like a different tome that is not listed above. These notebooks/journals are some of the themed books I've already designed. If you want a notebook or journal with the theme of your choice, please contact me so we can design the perfect notebook. If you have any questions or requests, please let me know! Please note that you are paying for creative services and time spend designing and personalizing these items per costumer. We do not sell or claim ownership over these images, pictures, graphics or characters. They belong to their respective owners. Every item will be gift-wrapped separately with a season specific themed gift wrapping paper. Amazing seller and quality products! I got it for my girlfriend (for Christmas) as a journal. I didn't notice before how many pages it comes with, which was my bad - but it'll suit her just fine. Looks good, feels sturdy enough. Looks just like the pictures and is very nicely made. Shop owner was very helpful and professional when my package arrived late. He kept in contact and made sure to keep me posted about any details he found out. The products will only be made and shipped after full payment is received. Exceptions can be made for large orders. The important thing is that you are happy! If you have any uncertainties or questions, please don't hesitate to ask. An order can be cancelled within an hour after ordering. Afterwards, items are already taken into production and are most likely being shipped out. Regretfully, cancellation requests posted later than one hour after ordering can therefore not be processed anymore. If, upon arrival, an item is not what the buyer expected, please contact us within two weeks for refund options. Refunds are not always possible due to the fact that many product are custom made per order. After mutual agreement, Items can be send back to us via the return address on the package. Upon undamaged arrival of the returned items, the item costs will be refunded. Only the item costs can be refunded. The payed shipping costs are not refundable. All pre-printed items (cards, envelopes, notebooks, etc.) will be send with LaPoste (French postal service), or TNT express for large orders. All printable items (digital invites, etc.) will be send by email within 1-2 workdays. Please note that these are estimated shipping times. There are a number of reasons (holidays, customs, strikes, disasters) why orders might arrive later than mentioned above. All orders should arrive within 6 weeks after shipping. Send a message if your country is not listed above and we will get you a delivery time estimate. Please note that actual delivery times may vary due to (random) customs checks or other unforeseen circumstances such as holidays. There are two shipping options available per order. The buyer is responsible for providing the correct shipping address. If an order is not delivered due to an incorrect shipping address, the buyer has to pay the new shipping costs if the item is returned, or for a complete new item including the shipping costs if the item is lost. We do not reimburse the buyer if the item is lost due to an incorrect provided shipping address. In the odd change that an order is not delivered within 6 weeks after shipping, and the provided address was correct, we will send out replacement items (free of charge of course), or offer a refund. If an item is damaged during shipping, please provide us with photographs of the damages and we will send replacement items as soon as possible (again, free of charge). We are not responsible for possible customs fees and import duties.